On a recent business trip to Toronto, Ontario, Canada I visited the CBC offices.Â CBC is the Canadian Broadcasting Corporation: Canada’s national public broadcaster.Â In the building is a small museum of sorts which was very interesting and informative.Â There was equipment and artifacts used in broadcasting throughout the CBCâ€™s history with editorial information explaining the importance and time line for that item. 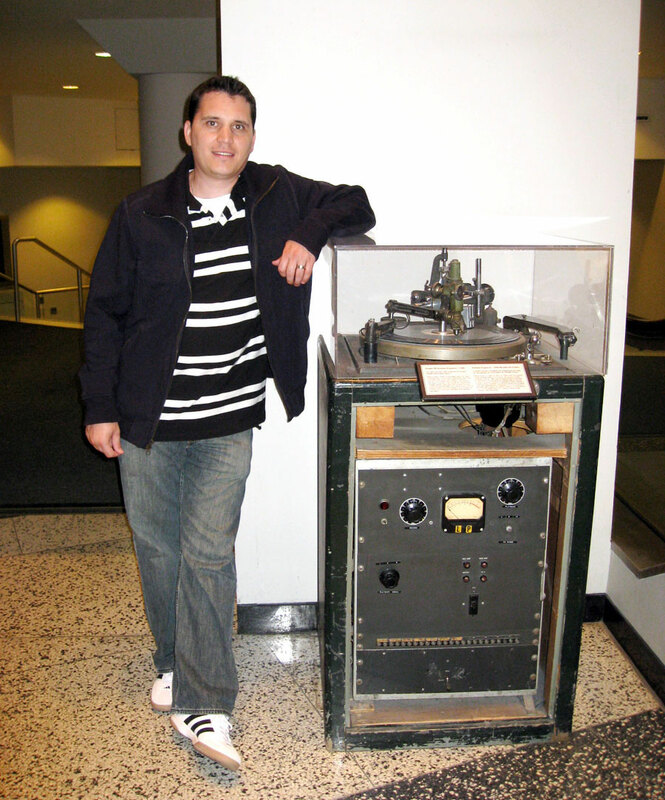 One of the artifacts I found interesting was a recordable turntable that would record live music/spoken word directly onto an empty vinyl disc at either 33 1/3 or 78 RPMs.Â This was a precursor to our modern day duplicators used over 50 years ago.Â For those who are not familiar with what vinyl is, they were the original records and were made out of wax with grooves carved in a circular pattern to record and play the music, spoken word, etc. To me, this shows that the duplication process and duplicating equipment is not as modern as we may think.Â The equipment has been around and in use for many years, but itâ€™s only recently been convenient and affordable enough for common everyday use by the masses.Â Thatâ€™s why I see duplication not only continuing long into the future, but also flourishing as a consumer electronic product as common in the office or home as a printer/copier. This is an image of me posing with the Presto 8N acetate engraver.Â Itâ€™s much larger than the modern duplicators like the Vinpower Digital SharkCopier. 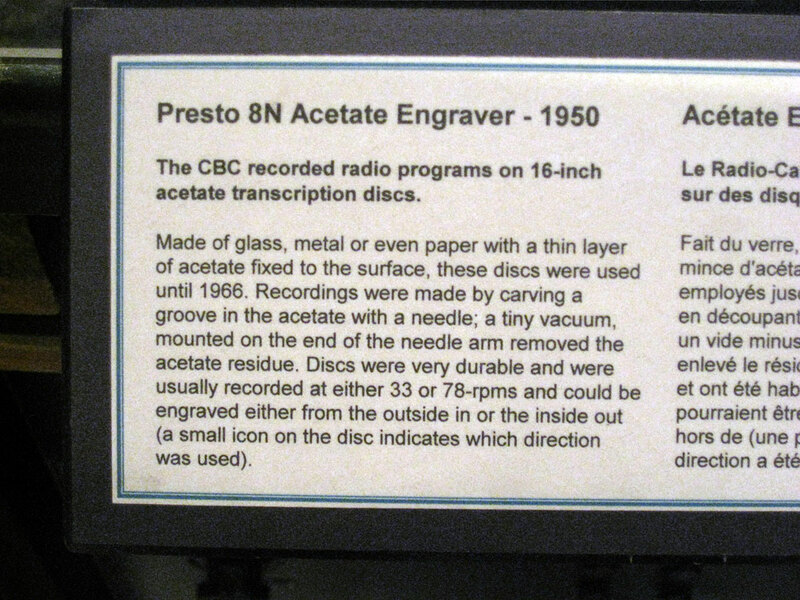 The descriptive plaque describing the Presto 8N acetate engraver. Thereâ€™s been a lot of discussion and speculation that direct video access (on-demand service) through a PC or cable/satellite provider will replace the DVD format for movie viewing by the masses, current research contradicts this assumption.Â Even though the development of high speed internet access and fiber optic cables allows movies to be downloaded quickly and provided in high-definition from the internet or through cable/satellite providers, consumers are still sticking with the tangible DVD format. As evident from current sales, consumers are still enamored with the optical disc such as the DVD format.Â According to data recently published on One to One online (25 July, 2007), in 2006 consumers spent US $23 Billion on DVD purchases and rentals compared to $932 million for on-demand services through the internet, cable or satellite.Â Even though on-demand service is a growing industry, thereâ€™s still a wide gap between it and the market for a physical DVD. As the DVD format capacity grows with the introduction of Blu-ray and HD-DVD formats, consumers will still have a draw for physical media that they can keep over an intangible on-demand service.Â This shows me that there is still significant growth ahead for the â€œDVDâ€ format in its various incarnations compared to digital transmission of data over a computer or television.Â So for those wondering if duplication is still a wise investment, I can say there are 23 billion reasons to say yes! In an effort to ensure fair trade in Europe, the European Commission (EC) has launched a general inquiry into the business practices of the Blu-ray and HD DVD formats as it pertains to alliances with Hollywood studios.Â The EC is requesting documents from all major Hollywood studios for all documentation and correspondence between the studios and the Blu-ray and HD DVD camps.Â This is the initial steps in a possible larger inquiry into anti-trust and anti-competitive practices that lead the various studios to announce loyalty to one format or another.Â This is not a full investigation at this point, merely a fact finding process to determine if there were any unfair actions taken by either the Blu-ray or HD DVD camps in persuading the studios to back their format over the other. I canâ€™t say what the outcome will be of this inquiry and it may turn into nothing, but it comes during a critical time for the formats as they battle for supremacy.Â If the EC determines that either format did not compete fairly when dealing with the studios, it could have repercussions throughout the industry.Â Then again, it could turn in to a fishing expedition with no results.Â Only time will tell and weâ€™ll bring it to you when we know more. Vinpower Digital will participate in the 2nd largest CE tradeshow in the world at Computex taking place in Taipei, Taiwan from June 5th ~ 9th, 2007.Â This years show has a greater importance because we have so many foreign customers traveling to the show to visit our booth.Â This year Vinpower Digital will also be joined by a booth from their sister company Waytech Media in Hall 4, booth # T3101. This year we launched several new products certain to gain more interest and exposure for our product line.Â The blue interface display, light weight SharkCopiers, extensionÂ of our Blu-ray capable duplicators (ShrkBlu) up to 11 drives, 15 target controller, and so much more shows our dedication to meet the needs of this growing market. Two of our engineers from Vinpower Digitalâ€™s corporate office in the USA, Tom and Eddie, flew out 1 week prior to the show to help the Taiwan team set up all of the products for the booths.Â Even though we worked hard the whole time they were here, they also livened up the office with their stories and laughter.Â We were focused on preparing for Computex, but Tom and Eddie made the experience more enjoyable. In the afternoon, we borrowed a cargo van from a vendor to deliver our demo equipment to the convention center.Â I drove with Eddie and this is the first time either of us had set up a booth before.Â I was nervous because everything from our parking location, where we unload, and how we transport the items to our booth were all new to me.Â Plus we had two booths to set up in one night, so it was critical everything went smoothly.Â All I could do was give it my best shot and hope everything turned out well. Â Thankfully, Robert (another member of the engineering team from the USA corp. office) arrived early and received all of the instructions we needed before we arrived.Â This saved us a lot of time and because of everyoneâ€™s hard work we were able to set up both booths in a short time.Â This was the first time in a week when I felt relieved and could relax.Â It felt like turning in a midterm paper to your professor and waiting to receive the grades.Â So far, everything is working out well and Iâ€™m looking forward to the start of the show. This is the first day of the tradeshow.Â Mandy and I left at 6am to pick up a customer from Germany (Frank and his father in-law) who are arriving in the morning.Â When we arrived at the airport, our guests had just left the gate.Â They were both very friendly which made us feel a lot more comfortable and released the tension we had in getting to the airport.Â Our original plan was to pick up them up, drop them off at the hotel, then go to the convention center to finish setting up the booths.Â That plan quickly flew out the window as the heavy rain caused huge traffic jams and we were stuck in traffic.Â Adding to our troubles, Mandy and I had already exhausted our English vocabulary and were struggling to keep the conversation going.Â We contacted Tom and Eddie to ask them to man the booth because we will be late and they too were cursed with the heavy traffic.Â To make matters worse, Tomâ€™s car broke down in the middle of the street in the pouring rain.Â Our boss, Calvin, not aware of our delay and problems showed up at the Vinpower Digital booth and no one was there, plus all of the equipment was still in boxes under the tables.Â This was not our lucky day and very difficult to manage but we made it to the show and everything was eventually set up.Â Afterwards it got a lot smoother. Tonight, we have dinner plans with a customer from Australia.Â We communicate frequently over MSN, so I feel like I am meeting a chatroom friend from the internet.Â The dinner went very well and we discussed a lot of business issues.Â It was a good end to a stressful day. After a rough start on Tuesday, no one dared to be late for the rest of the show.Â These two days went very smooth and our booth looked even better because of flower arrangements sent to us by some of our vendors.Â We had a planned visit by a large potential customer from the USA.Â The conversation went very well and I felt they were impressed with our presentation as we all put forth out best efforts to speak with them.Â We look forward to landing this account.Â We also met with many new potential customers who we can hopefully start new business with.Â In the evening of the 6th we had a planned dinner with our German customer who we will take on a tour of Taiwan on the 7th.Â These two days were very eventful and much easier now that we are accustomed to the trade show. 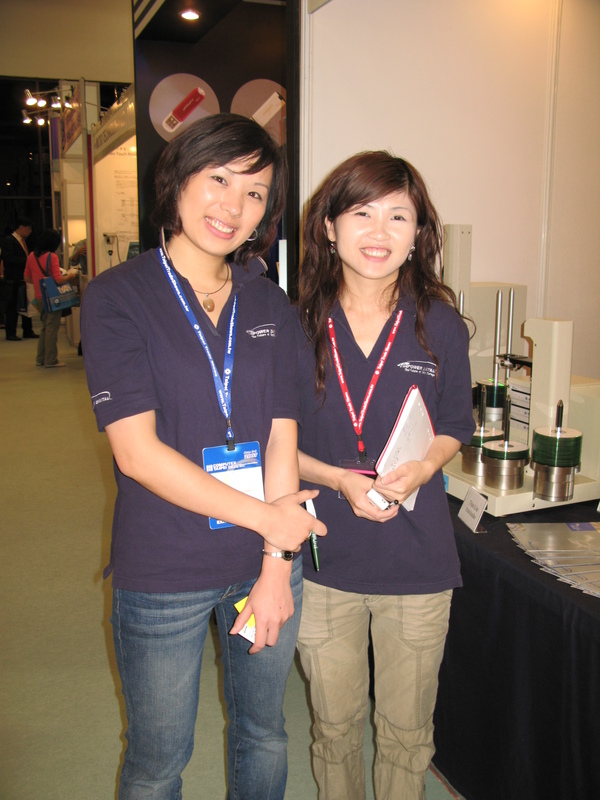 Today Iâ€™m working at the show, but two members of our staff are playing tour guide with our German customer and taking them to Dan-tsui.Â Even though itâ€™s raining, they would not let it ruin their day.Â Our customers made a special request to try stinky tofu and an oyster omelet which we were happy to oblige.Â Afterwards they walked non-stop so they could see everything.Â Poor Tom was exhausted and coming upon a massage parlor suggested they get a massage so he could rest.Â But they were not interested, foiling Tomâ€™s â€œperfectâ€ plan to take a break. In the evening, Mandy was responsible to take our Japanese customers to dinner.Â This was a difficult task because Mandyâ€™s Japanese was limited and our customers English was just as limited, so they communicated through hand gestures and broken bits of English and Japanese.Â Mandy said it was like they were dancing with their hands flying up and down.Â It made me laugh as I pictured it. As I look back at the week, we overcame many obstacles, entertained numerous customers, informed many more potential customers and learned a lot about trade shows.Â The memories Iâ€™ll treasure most of all are the good times and friendships that were created during this show with our co-workers living in the USA.Â Â I hope the show will be successful for our company and that we will receive many orders.Â Only time will tell, but now that the show is over, I have more work to do to turn the connections into sales! 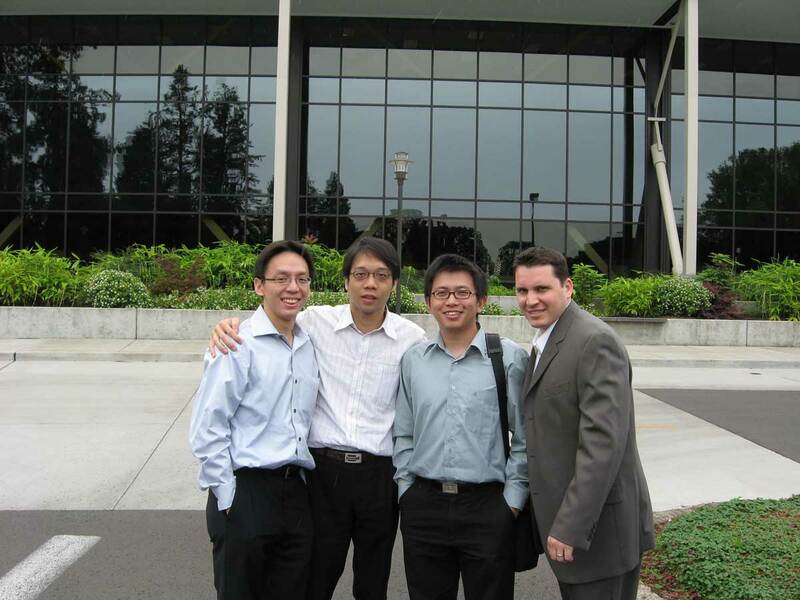 Tom, Peter, Eddie, & Ryan dressed for success as we prepare to enter our meeting. 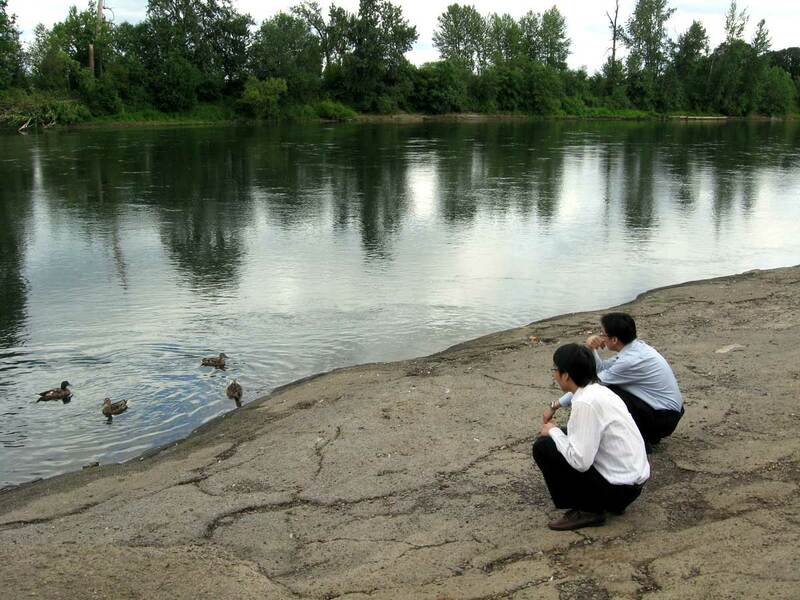 After our meeting Peter and Tom find some relaxation watching the ducks in the stream near our hotel. 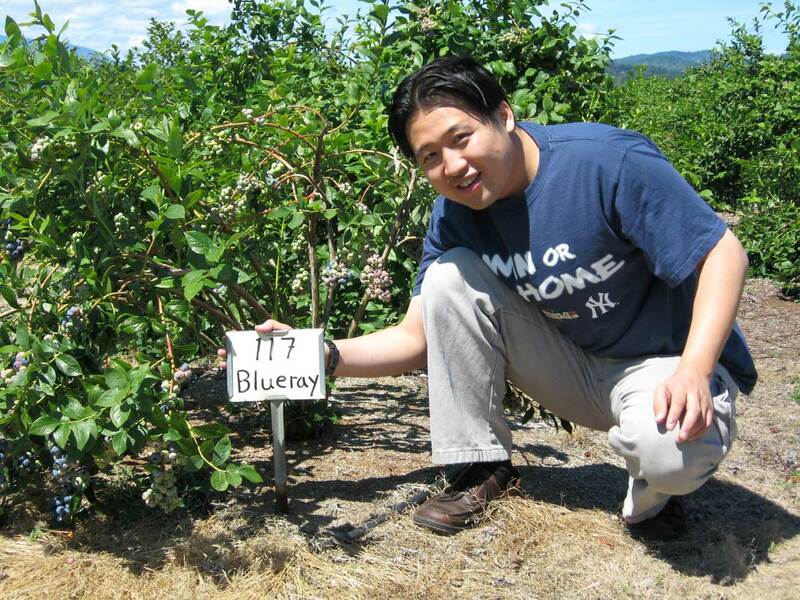 Even picking Blueberries, Calvinâ€™s mind is still on work as he compares the large plump Blueray berries to the new high capacity Blu-ray discs. 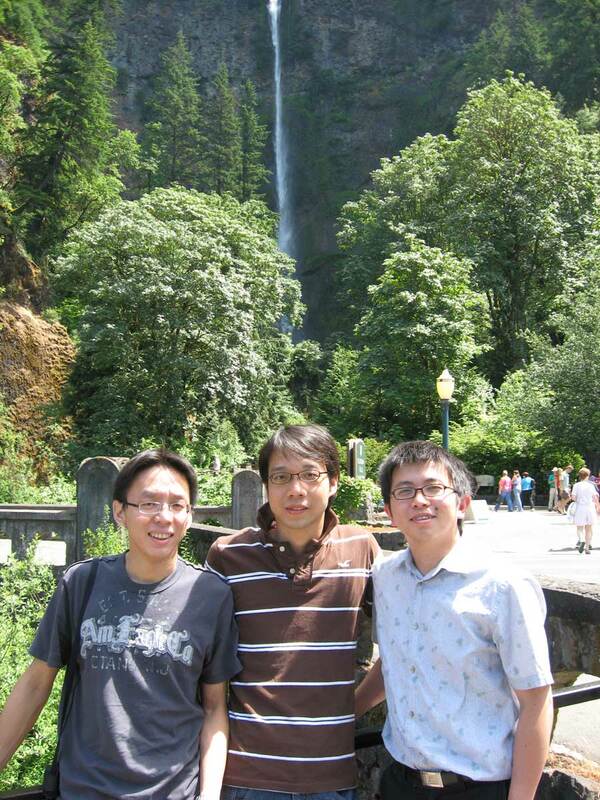 Tom, Peter, and Eddie pose in front of a massive waterfall near Portland, OR.